The Wonkido Visual Organizer addresses the area of Teaching and Learning, with a parent outreach component. Successful teaching and learning needs to include support from the home. Children today are growing up in an information age. Access to technology is assumed and having the skills to use technology in the future is implied. Children need to learn at an early age the benefits of technology and how to responsibly integrate it into their lives for more than social communication. Teaching children early is important to establish guidelines about technology and how it is used. The Wonkido Visual Organizer is an individualized learning tool designed to teach children executive functioning skills such as organization and planning, while collaborating with other educators and parents. The executive functioning skills make up the operating manual to time management and organization, skills both children and adults need for better life management. The Wonkido Visual Organizer, utilizes the power of cloud computing and mobile technology, to both teach important executive functioning skills as well as collaborate with parents and educators working together to help children succeed. Individualized learning is the future of education and Wonkido empowers children to learn how to independently manage their own time while still receiving guidance and oversight by parents and teachers. The Organizer uses eye-catching visual displays for a customized personal schedule and daily organization with images to retain focus and aid comprehension, as well as allowing a child to add to their own schedule teaching planning and prioritizing. The program offers a customized goal oriented rewards program to help motivate children who need additional incentives for behavior. As educators, it is essential to introduce and practice these skills with children early so they have a grasp on organizing their time and activities as they continue to higher education. Another great feature the Visual Organizer offers is a system for communication between parents and teachers. The Organizer allows for teachers to view schedules, assign homework, and communicate with parents through a message system. This feature of the organizer creates a successful learning environment because everyone is in constant communication. Parents and teachers can avoid waiting to hear back from one another about unanswered questions. Teachers can easily access and respond to any problem the parents or students are having! Teachers are able to manage groups of students, assigning a single activity to a child’s schedule, and viewing activity reports to compare the time it takes each student to complete the same task. Wonkido allows for class discussion both anonymously as well as with a child’s name to allow easier social comments regarding an activity. All visible by other teachers and parents to stay coordinated and involved in what happens at school. Learning doesn’t have to stop when school is over, and the cloud base of the Wonkido Organizer allows a student to stay organized and connected 24/7. The Wonkido’s Visual Organizer is perfect for teaching children critical executive functioning skills, like organization, time management, and goal setting. It provides early success for children who have the opportunity to develop skills for an easier transition at school and as life becomes more challenging. The Wonkido Organizer was just released October 2012 on iTunes. In just the month since the release The Wonkdio Organizer is already being used by therapist and teachers at public and private school nationwide.
. The app targets exactly what it intends – organisation, independence, time management skills.
. It best suits students who are able to complete daily tasks, but just need help with completing them independently or within a certain time frame.
. You can coordinate tasks across multiple environments. This helps to make the child’s progress transparent to everyone involved in the child’s program – you can link different people to be able to view your child’s progress.
. This app helps your child take more responsibility for achieving organisation and independence goals.
. It also helps the adults be honest with what everyone is expecting from your child. In addition, it helps to see what the child needs to do over the whole day, across home and school for example, so the child is not overloaded.
. Rewards can be earned – you can set the number of points per activity. Higher points might be given to help motivate your child complete more challenging or high priority tasks.
. All adults can view the child’s progress.
. A message board facilitates easy communication between people involved.
. The child can use the organiser in any environment – home, therapy, school. It’s one consistent system that can apply to their whole day, irrespective of environment.
. The physical arrangement is appealing and easy to follow.
. This system will save a lot of time in printing off schedule pictures. The activities can be saved and used at any time.
. You can set a timer for tasks – fantastic for those kids that can do the task but lack the intrinsic motivation to complete the tasks in a timely manner. The timer gives great motivation!
. You can log-in from a range of devices, such as the iPad and / or the computer! This offered great flexibility. I found the computer to be the best way to set-up the system. « Becoming familiar with the program. It took some time to navigate through the different components of the program but this time investment is well worth it. « The images filter by words used in the instruction. Perhaps having a greater number of images available per view would save some time scrolling through. There are some cultural differences for vocabulary and images so perhaps in future updates these might be included. You can add your own images, but this feature did take a little extra time than expected. « The video tutorials were good, but the sound quality wasn’t always clear. There appear to be some more recent updates that provide pop-up prompts and these look great. Spend the first few days programming activities and instructions as I was actually doing the activities with my child. This way the programming occurred in the moment and I knew exactly what needed to go into the schedule and instructions. By taking the iPad with me, I could take photos of the activities and / or items so these were already in my photo library so it was simpler and easier to add these to the schedule in my ‘programming days’. – Start with key activities that occur frequently over the days or weeks. I might have only one or two activities each day, but this made it easier to get to know the app / program. As I became familiar with the app I added more activities and tasks. – Start with short, simple instructions. Then combine two shorter instructions to form one longer instruction, e.g., “Make your bed” + “Pack your bag” = “Make your bed, then pack your bag”. Gradually add harder ‘time’ words, e.g., “First, make your bed, then pack your bag”, “Make your bed before you pack your bag”. – By using different wording, but keeping the meaning / sequence the same, you can teach different language concepts. When these are mastered, use more complex terms that change the order of the sequence. – As your child becomes more independent with routine, everyday tasks, give less points or rewards for these. – Give more points or rewards for new or challenging tasks. – Add social praise and encouragement in your instructions for activities, e.g., “Make my bed”, “Pack my Bag”, “Great getting ready for school!”, “Brush my teeth”. – Write the instructions from your child’s perspective – this can help map your child’s internal dialogue to themselves so they can begin to internalise the instructions and sequences, and increase independence away from the visual reminders eventually. Overall, I really like this app and would recommend it to others. Great job Wonkidos!! I decided to build the Wonkido Organizer after years of going to therapy and asking the therapist for more advanced tools for children utilizing the benefits of todays technology, yet not finding what I was looking for. After almost 3 years of therapy with my son who was diagnosed PDD-NOS at the age of 3, I attended a conference teaching visual strategies for high functioning autism at home and in the classroom. I was shocked to see they were still suggesting Velcro and lamination as a way to create a visual schedule for a child. Coming from a corporate background in technology and having a masters in psychology, I knew the technology had the capability to both streamline the creation process of making visual schedules as well as taking away the stigma of a child having a laminated schedule amongst their peers. It was after seeing the Dr.’s still recommend non technological tools, I decided to start a company creating advanced developmental tools for children. I wanted to create better tools that I knew my son would need throughout his life. There is so much that I love about the Wonkido Visual Organizer. 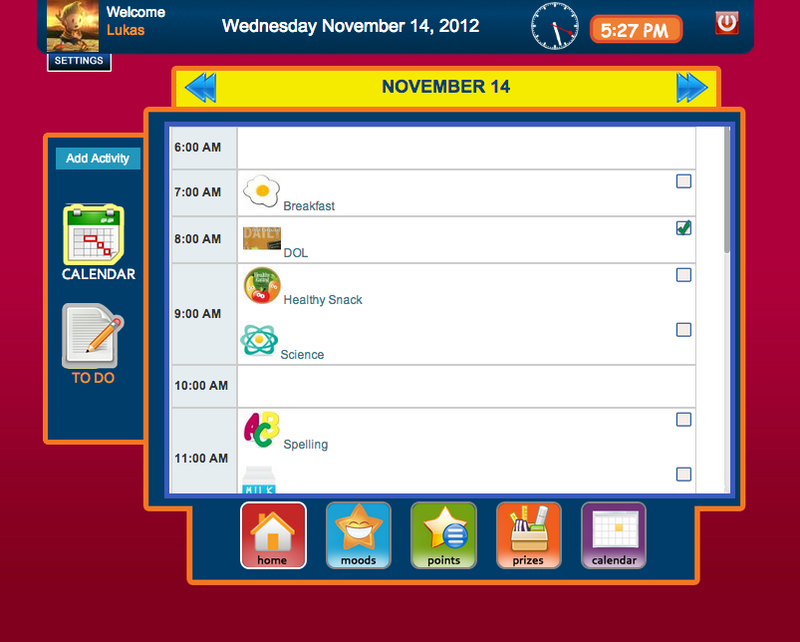 It is a very comprehensive visual schedule that provides custom user interfaces for teachers, parent and students. Everyone has their own unique login and a personalized view of their information. My favorite page of the app is the message wall, as it summarizes all of the activities, notes and entries from my child and his teachers and therapist. I have so many favorite features. The one I love the most which is probably the most unique to our application, is the ability to “share” a child with other educators or anyone involved in caring for and educating this child. There are normally so many different educators or therapist in our children’s lives and it would be so great if they can all work together and share successes and see what each one is doing. The organizer allows for multiple educators to be connected to a child’s schedule, see what he has both at school and after school, as well as communicate with each other to best coordinate a unified approach for a child. I love as a parent seeing the mood entries by my son during the day. They come directly to my email and are also recorded on the journal so that I can view them and talk with him about his day when he gets home from school. Next, I love the flexibility of what the Wonkido Organizer offers to a user. We have created different methods to log in, and have found that most children love to use an iPad while teachers and parents prefer to log in via their own personal computer. I love the flexibility to make the user experience easy and fun for everyone. I also love the newest feature of the different customizable display settings for a child. The organizer allows for 3 different views that a child can choose from, which allows for an appropriate user interface for different ages of children. Keeping the Wonkido Organizer “cool” as the kids get older. This app was just release a few weeks ago mid Oct 2012. It took me 2 years to complete development of this program to a point that I was comfortable to release to iTunes. We are constantly creating new features and making sure it fits the needs of everyone who uses it. 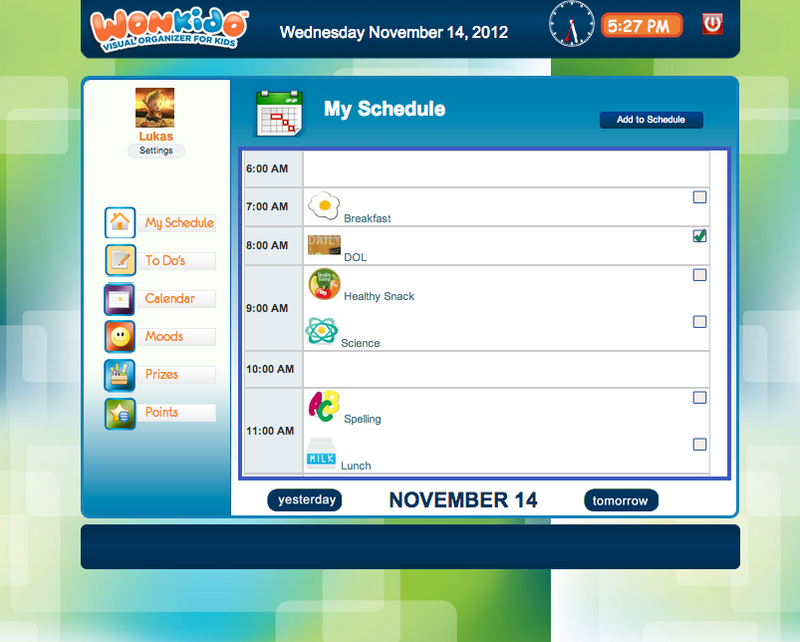 We are always adding features and new ways to use the Wonkido Organizer. We recently added both a digital and an analog clock for the child to see the time, as well as a way to easily add activities on specific days of the week. More updates that will come soon included the ability for educators to link lessons to scheduled activities, as well as group reports and discussion forums, so a teacher can compare how long each student takes to complete a lesson compared to the class. The Discussion forums will allow for more collaboration between students, but at the same time, allowing a parent to have a view on what is happening in the class so that they may continue the discussion at home for a true 24/7 learning environment. This app has a huge range of children who would benefit from using a visual schedule and organization. I have found that for children with visual learning or developmental learning needs, the Wonkido Organizer plays a huge part in helping their motivation as well as organization. A teacher said it best when she said that for students with special needs the Wonkido Organizer is need to help a student succeed, however their is a huge benefit for all students regardless of development. Every child needs to learn organization and how to manage their own schedule. Most of the time we expect a child in middle school to know how to manage their workload, yet they have not been taught or given a tool in which they can learn from. Students from 5 – 15 would greatly benefit from the use of the organizer. What I love about it is the flexibility to teach a child personal accountability and independence at an early age. In elementary school, a teacher or a parent may be the person who adds activities and assignments to a child’s schedule, however as a child gets older, they will begin to enter the information themselves and parents and teachers can just provide guidance and oversight helping a child learn how to plan and prioritize on their own. What are the biggest challenges you have found with the app? The biggest challenges is to allow for an easy to follow and use application when there is so many features and management tools for a user to use. It is a very comprehensive tool and I want to ensure that every user feels like they have the support they need to understand and best use the organizer. I am happy to offer any support and guidance to anyone who may have questions about how to use the organizer with their students or their own child. The next challenge is to address the issue of time zones for international users. We are currently running our program using a cloud system so users can access the organizer anywhere and on any device they may need. Because our servers are based in the US the schedule may not show on the correct date for international users. We are aware and are working to address the issue. Thank you so much for sharing your insights into your new app. I hope this has helped people understand our wonderful this app is.